Just Sketching: New Book Is Out! I have just released my new book, Drawing Flies 365. What started out as a quiet personal project quickly gained a world-wide following. This book chronicles the artist’s journey as he challenges his creativity to draw or paint a fishing fly every day for an entire year. The book contains full color images of every fly created for his 2008 daily blog drawingflies365.blogspot.com. Along with the beautiful images, you will also venture into my head as I describes what was on my mind as I created some of my paintings. The book is available as a soft cover or as a hard cover with a dust jacket. You do not need to be a fly fisherman to appreciate the artwork contained in this book. 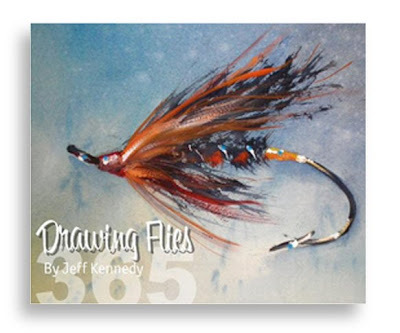 Drawing Flies 365 the book, makes a great addition to any angler’s or artists library. Click here to preview and purchase your copy. If you purchase before December 31st of this year, enter the promo code GREATGIFT and receive $10 off! he took photos of them that were reminiscent of the original pictures.